Title: Evangelical Missionaries Are Reporting That President Bush Has Done Great Damage To Their Effort To Reach The Lost For Jesus Christ! 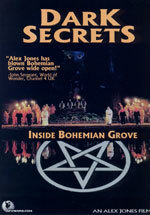 1) "Dark Secrets of Bohemian Grove"
Subtitle: Since the entire world believes that Bush's disastrous invasions of Afghanistan and Iraq were fueled by his "Christian" beliefs in End Times prophecy, lost people throughout the world are turning away from Jesus' Gospel because they hate "Christian" Bush. In February, 2004, I came to the conclusion that the Illuminati Plan called for the deliberate discrediting of President Bush! And, of course, since Bush is the good soldier he is, he would be completely complicit in this Plan. We reported this conclusion in our archived article, NEWS1929, "Campaign To Discredit Bush Seems To Be Moving Into Higher Gear". This article deals with one particular outworking (scene) of a script to discredit President Bush which I have been following for nearly six months now. I firmly believe that the Illuminati may have written their script in such a manner as to purposely discredit George Bush .."
As we begin our discussion, remember one fact: when one Illuminist begins to attack another, you are looking at the outworking of a carefully scripted plan. All Illuminists are equally committed to moving the world to the New World Order (a.k.a., Kingdom of Antichrist), and to achieve this coveted goal, are willing to take opposite sides to act out a role in a Dialectic Struggle [Read NEWS1599 for full details on how the Dialectic Struggle works]. If President Bush is thoroughly, completely discredited, he will likely take down with him the only two enemies the Illuminati acknowledges: National Sovereignty (Patriotism) and Fundamental Christianity. As we have been repeatedly warning, once President Bush is thoroughly discredited, and possibly even forced out of office, his political demise will so thoroughly discredit genuine Christianity that we might be set up for severe persecution. The rest of this article will demonstrate that a global discrediting of Christians has, indeed, begun! But, more importantly, it is affecting the way the lost people of the world view Jesus and His precious Gospel! Let us now examine this current news story. "NOTE: For the purpose of this article, we will define 'Militarism' as an attitude among followers of the Christian Right and other conservative Americans, which favors an aggressive, military approach to foreign policy problem solving. "Militarism is that which favors 'pre-emptive first strikes' and military intervention in foreign nations, based on such justifications as total obedience to the President, looking for weapons of mass destruction, revenge for 9-11, war on terrorism, nation building, clash of civilizations, bringing democracy to the Third World, fulfillment of Bible prophecy, etc. The Christian Right in general has become known for its support for militarism." Did you catch that pertinent sentence? "The Christian Right in general has become known for its support for militarism." One of the greatest mysteries of all time to me is this unbelievable blindness of Christians today. Starting with the preacher in the pulpit and extending down through the church leadership and to the average pew sitter, Christians today are accepting President Bush as a Born Again Christian based upon his weak testimony, while ignoring his grievous actions, his bad spiritual fruit. With this information as background, let us now continue to examine the real-life consequences which this misguided belief Christians have about President Bush is having on the foreign Mission Field. Cutting Edge has been warning since the aftermath of 9/11 that "Christian Dominionism" -- as it is properly defined in the above segment -- was the driving force of President Bush's brand of Christianity, and that such a viewpoint of the End Times Prophecy is clearly heretical. As the "Christian Dominionist" wars in Iraq and Afghanistan slowly grind onward,consuming hundreds of thousands more victims, more and more people throughout the world are going to really hate Christians of every country. Furthermore, once the realization hits home amongst the people of the world that this "Christian Dominionist" war is going to cause the death of one billion people throughout the Middle East alone through Depleted Uranium poisoning, the hatred is going to quickly rise to levels which will allow governments all across the globe to begin arresting Christians, throw them into prisons, and eventually murdering many of them. At this point, the martyrdoms foretold in the Book of Revelation will begin. 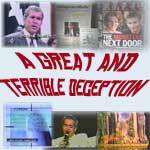 And, "Christian" President Bush will be at the forefront of this complete discreditation. Let us now return to this article to learn more about how Bush's "Christian Dominionism" is negatively impacting the Mission Field right now. "Gordon MacDonald of World Relief has sounded forth a warning on what our support for militarism is doing to the image of American Christians in the Third World: 'We are now part of an evangelical movement that is greatly compromised - identified in the eyes of the public as deep in the hip pockets of the Republican Party and administration. Our movement has been used. Any of us who travel internationally have tasted the global hostility toward our government and the suspicion that our President's policies reflect the real tenets of Evangelical faith'." My son, Ryan, married a Brazilian lady seven years ago. Last year, he took his family back to visit Marcia's family in Brazil, going back to her small home town. As Ryan walked down the public street, he was greeted, time and time again, with Brazilians pointing their thumbs downward, and saying, in English, "No Bush". Ryan really understood, for the first time, the terrible attitude towards America which President Bush's wars have created, by the people "on the street". On Judgment Rewards Day, many genuine Christians are going to learn that their mistaken support for this President has both set them in line for loss of reward as they supported such a genocidal war and because their support for this President has poisoned the ability of spiritually lost people in foreign lands to listen openly to the Gospel of Jesus Christ. This scenario is one of the most sad I could have ever, ever imagined. Truly, Jesus was right when He warned of unparalleled deception at the End of the Age (Matthew 24:4, 11, 24). This type of deception is upon us now in so many ways that we must all understand the lateness of the prophetic hour. Are you spiritually ready? Is your family? Are you adequately protecting your loved ones? This is the reason for this ministry, to enable you to first understand the peril facing you, and then help you develop strategies to warn and protect your loved ones. Once you have been thoroughly trained, you can also use your knowledge as a means to open the door of discussion with an unsaved person. I have been able to use it many times, and have seen people come to Jesus Christ as a result. These perilous times are also a time when we can reach many souls for Jesus Christ, making an eternal difference.